This was my prototype. I went through several version before deciding on this layout. 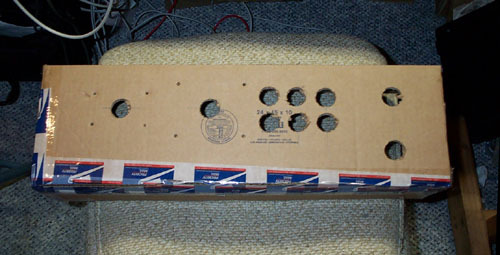 The carboard prototype allowed me to mount all the controls and buttons to see if it was going to work. I got a blank galaga CP from Mikes Aracde www.mikesarcade.com. I measured out the buttons with tape and started drilling. 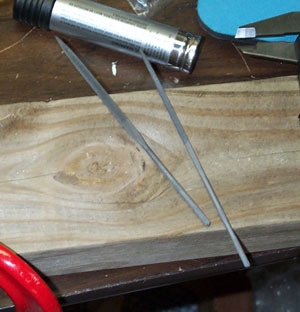 You'll need a 1 1/8" Bi-Metal hole saw. After drilling the wholes for the carriage bolts, I used these small files for squaring the holes as you can see on the bottom two holes. Here are some pics of the controls and buttons all mounted. I wanted a way to be able to disconnect the CP easily when it needed serviced. So as a finishing touch, I bought an ATX motherboard extender, cut it in half and pluged it into itself. 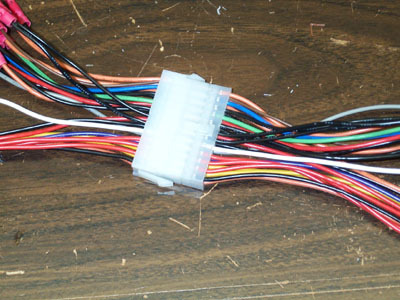 I then wired one end to my controls and the other to my keyboard encoder. 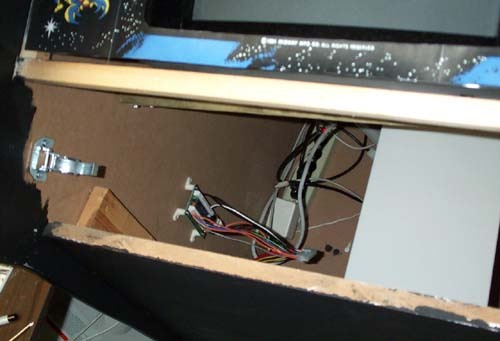 Then I mounted the keyboard encoder to the inside of the cabinet. 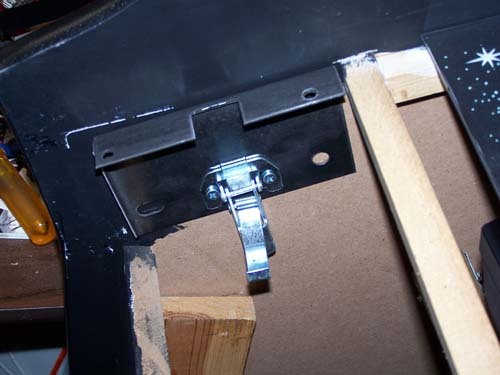 It also have the standard Midway contol panel strikes on the sides for the latches to hook into. So when I need to remove the CP I can just unplug the ATX plug and undo the side latches. (See the Cabinet link at the left for a better understandings). 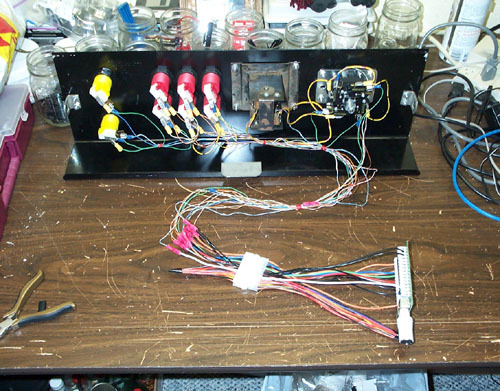 Here is a pictures of the keyboard encoder mounted inside the cabinet with the ATX plug wired in. This is a view looking down from where the CP would be. 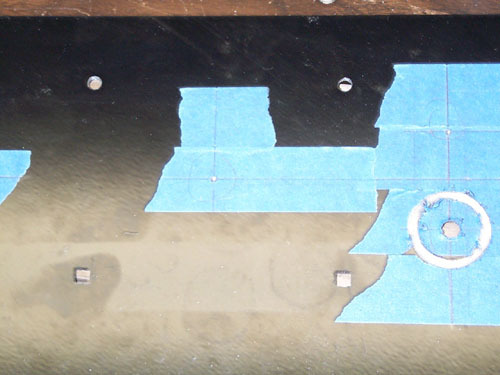 My Midway control panel brakets are now installed to help better support the control panel. 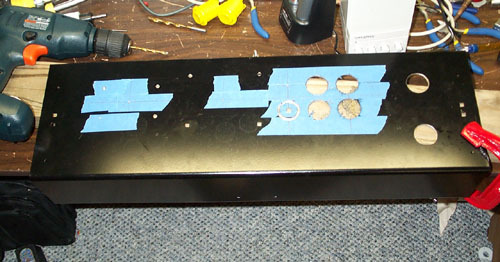 Here is the Control Panel Overlay installed. I downloaded the Adobe Illustrator file from www.localarcade.com and modified it to fit my custom controls then had it printed at www.classicarcadegrafix.com. 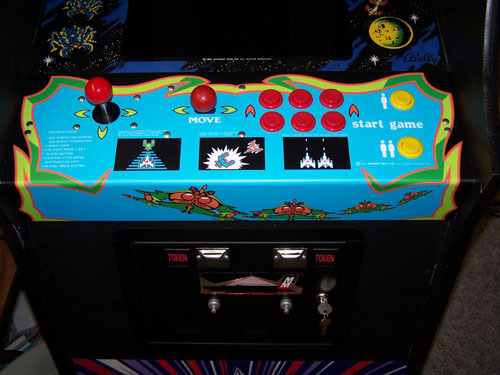 This is an image showing how the distance from the center of the 2-way joystick to the fire button on an original Galaga CP is 6 1/2" and that it is the same as the distance between my 2-way and the last fire button. 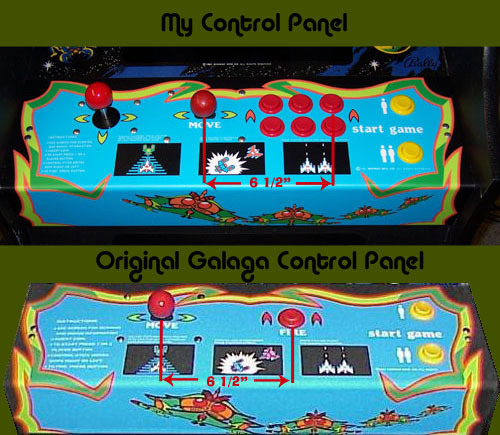 So my CP retains the same feel as the original Galaga CP.